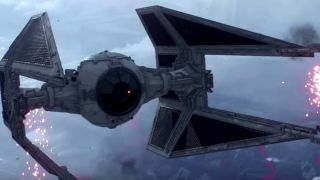 Battlefront's Fighter Squadron mode thrusts you into lavish team dogfights soundtracked with radio chatter and an orchestral score designed to surgically target the nostalgia centre of the brain. It looks like the objective-based 10 vs 10 fights will have their equivalent of the ground game's hero characters. The Millennium Falcon and Slave One turn up to spiral heroically through some laser fire, and there's even a bit designed to mimic the Death Star trench run. Fighter Squadron is playable on the show floor, so we'll have some hands-on impressions as soon as our Bothans have secured access.